Just wanted to present the female priest I just finished... aka the REAL battle nun! I didn&#39;t want to use any of the male priests GW offers in my Sisters of Battle army, so I decided to convert an old Mortheim Sigmarite. 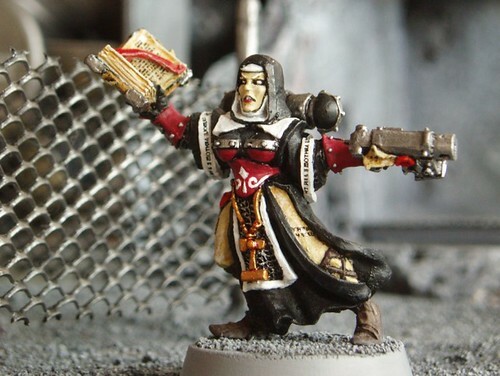 Sister Act... *cough* Really good model, I think the writing in the book is superb, heh.. a female priest thats original. Wow...now that&#39;s the true meaning of &#39;fine print&#39;! On a more serious note: I wish I had planed the color scheme better then I could have made her upper breast part more "fleshy"... but some green stuff work would have been necessary. Well, too late... now she looks like a well behaved lady. ...with a gun. Your freehand is really good, especially on the book text and her face.